City in the Prussian province of Brandenburg. It was the residence of the electors of Brandenburg; and here the Great Elector, Frederick William, ratified May 20, 1671, the agreement by which he permitted fifty families of the Viennaexiles (comp. Jew. Encyc. ii. 329, iii. 70) to settle in his dominions. David Michel is the first Potsdam Jew of whom there is record. His name occurs in a document of 1690. In the catalogue of the visitors to the Leipsic fair, Jews of Potsdam are mentioned in 1693 and 1694. The foundation of the congregation, however, dates from the first half of the eighteenth century, when David Hirsch (Präger) received (1730) special letters of protection to enable him to establish silk- and velvet-factories in Potsdam. Other Jewish manufacturers, similarly privileged, soon followed; and in 1743 the congregation, numbering ten families, acquired a cemetery. In 1754 it engaged a ḥazzan, who acted as sexton also, and in 1760 a rabbi, Jehiel Michel, from Poland, who officiated until 1777. In 1767 the first synagogue was dedicated in the presence of the Prince and Princess of Prussia. The report, however, that King Frederick the Great erected this synagogue at his own expense is a legend, based on the fact that he granted the congregation a loan. 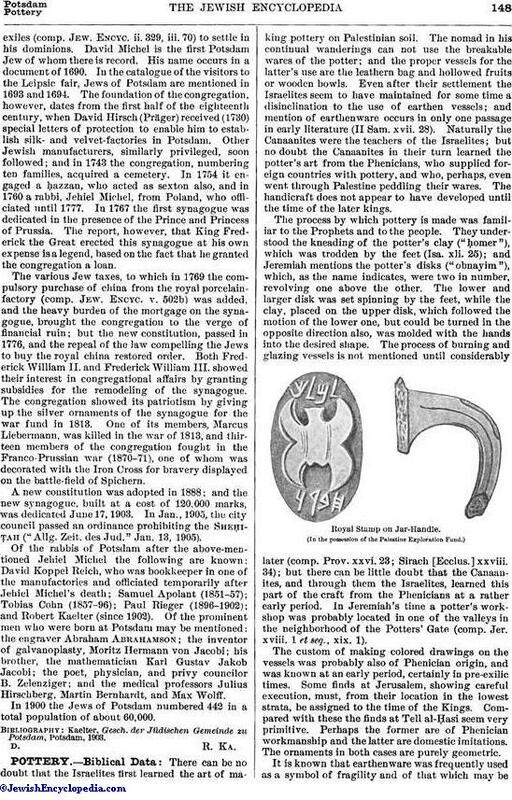 The various Jew taxes, to which in 1769 the compulsory purchase of china from the royal porcelain-factory (comp. Jew. Encyc. v. 502b) was added, and the heavy burden of the mortgage on the synagogue, brought the congregation to the verge of financial ruin; but the new constitution, passed in 1776, and the repeal of the law compelling the Jews to buy the royal china restored order. Both Frederick William II. and Frederick William III. showed their interest in congregational affairs by granting subsidies for the remodeling of the synagogue. The congregation showed its patriotism by giving up the silver ornaments of the synagogue for the war fund in 1813. One of its members, Marcus Liebermann, was killed in the war of 1813, and thirteen members of the congregation fought in the Franco-Prussian war (1870-71), one of whom was decorated with the Iron Cross for bravery displayed on the battle-field of Spichern. A new constitution was adopted in 1888; and the new synagogue, built at a cost of 120,000 marks, was dedicated June 17, 1903. In Jan., 1905, the city council passed an ordinance prohibiting the Sheḥiṭah ("Allg. Zeit. des Jud." Jan. 13, 1905). 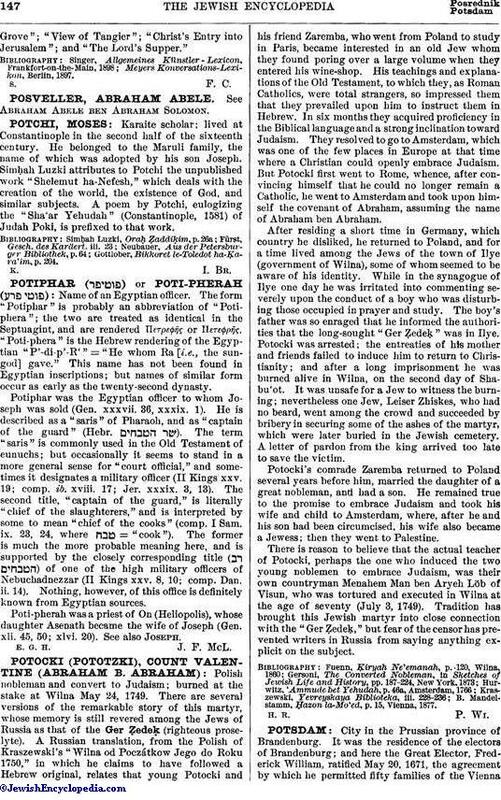 Of the rabbis of Potsdam after the above-mentioned Jehiel Michel the following are known: David Koppel Reich, who was bookkeeper in one of the manufactories and officiated temporarily after Jehiel Michel's death; Samuel Apolant (1851-57); Tobias Cohn (1857-96); Paul Rieger (1896-1902); and Robert Kaelter (since 1902). Of the prominent men who were born at Potsdam may be mentioned: the engraver Abrabam Abrahamson; the inventor of galvanoplasty, Moritz Hermann von Jacobi; his brother, the mathematician Karl Gustav Jakob Jacobi; the poet, physician, and privy councilor B. Zelenziger; and the medical professors Julius Hirschberg, Martin Bernhardt, and Max Wolff. In 1900 the Jews of Potsdam numbered 442 in a total population of about 60,000. Kaelter, Gesch. der Jüdischen Gemeinde zu Potsdam, Potsdam, 1903.